If owning a home is the gateway to the middle class and beyond, then more than two-thirds of American households have crossed that threshold. But who makes it, and who doesn’t, varies widely depending on the race, ethnicity and nativity of the householder. Whites are the most likely to own a home, and Hispanics and blacks are the least likely. However, minority households have closed the gap somewhat in recent years. The homeownership rate among immigrants is initially low but increases with the number of years of U.S. residence. And there are signs that immigrants are moving more quickly into homeownership. The push to acquire a home has proved to be a double-edged sword. The surge in ownership from 1995 to 2004 was accompanied by rapid growth in debt in the absolute and relative to income for homeowners (Dynan and Kohn, 2007; Pew Research Center, 2008). Rising foreclosure and mortgage delinquency rates reflect the fact that, for some families, debt had swelled to unsustainable levels. 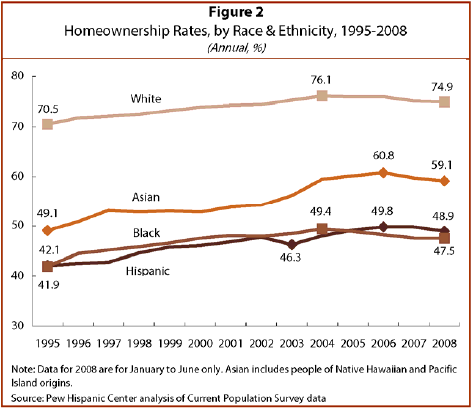 All households, regardless of race and ethnicity, experienced rising homeownership rates from 1995 to 2004. However, results from 2004 to 2008 were mixed. Homeownership rates for some groups continued to increase after 2004, but other groups lost ground. Hispanics experienced a more sustained period of growth in homeownership than did white or black households. The Latino homeownership rate increased from 42.1% in 1995 to 49.8% in 2006 (Figure 2). There was only one interruption—homeownership slid backwards from 2002 to 2003, reflecting the cumulative effect of the 2001 recession and the economic slowdown that followed. In 2008, the homeownership rate for Hispanics was 48.9%, nearly 1 percentage point lower than in 2006 but 6.8 points higher than in 1995. The homeownership rate for whites peaked in 2004, two years sooner than the peak for Hispanics. For white householders, the homeownership rate increased from 70.5% in 1995 to 76.1% in 2004 (Figure 2). It stood at 74.9% in 2008, 1.2 percentage points lower than in 2004, with most of the decrease occurring after 2006. Blacks are about as likely as Hispanics to be homeowners. But their homeownership rate reached a high in 2004 and has fallen farther since then. The homeownership rate for blacks increased from 41.9% in 1995 to 49.4% in 2004, a gain of 7.5 percentage points. But the rate reverted to its 2000 level in 2008 by falling to 47.5%, a 1.9 percentage point decline in four years. The Asian homeownership rate increased faster than any other group, from 49.1% in 1995 to 60.8% in 2006. It has, however, fallen notably since then, to 59.1% in 2008. Despite recent setbacks, all minority groups have chipped away at the homeownership gap with white households. The Latino homeownership rate in 1995 (42.1%) was 28.4 percentage points less than the rate for whites (70.5%). The gap in 2008 was still high but had decreased to 26.0 points. Asians are closing the gap most rapidly, shrinking the disadvantage vis-à-vis white households from 21.4 percentage points in 1995 to 15.8 points in 2008. Immigrants are less likely than the native born to own homes. About half of foreign-born householders are homeowners, compared with more than two-thirds of the native born. The current gap in homeownership between immigrant and native-born households is narrower than in 1995 but still wide. From 1995 to 2004, homeownership among foreign-born and native-born households increased by similar amounts. For immigrants, the homeownership rate rose from 46.5% to 51.7%, an increase of 5.2 percentage points. For the native born, it went up from 66.1% to 71.5%, an increase of 5.4 percentage points (Figure 3). While homeownership for the native born peaked in 2004, ownership among the foreign born maintained an upward trajectory, reaching a high of 53.3% in 2006. 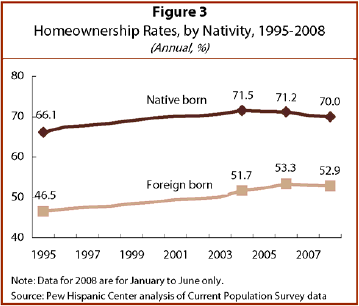 Then, from 2006 to 2008, the homeownership rate for immigrants dipped modestly to 52.9%. The rate for native-born householders decreased by a larger amount, from 71.2% in 2006 to 70.0% in 2008. Although the gap in homeownership between immigrant and native-born households diminished slightly from 1995 to 2008, it is still quite large (17.1 percentage points). 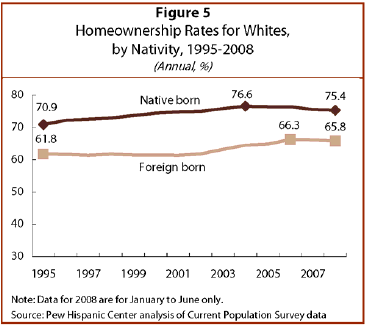 Figures 4 to 7 compare the homeownership rates for foreign-born and native-born householders by race and ethnicity. The gap between immigrants and the native born within a single racial and ethnic group is narrower than in the aggregate. Among Hispanics, for example, 53.6% of native-born householders owned a home in 2008, compared with 44.7% of foreign-born householders, a difference of 8.9 percentage points. 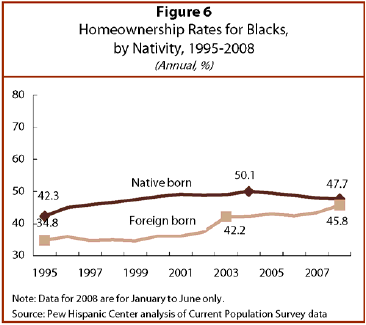 Homeownership rates among foreign-born Latinos and blacks did not decline in the post-2004 period and recorded their highest levels in 2008—44.7% for Hispanics and 45.8% for blacks. Native-born Latinos and blacks, however, witnessed notable drops in homeownership in recent years—from 56.2% in 2005 to 53.6% in 2008 for Hispanics and from 50.1% in 2004 to 47.7% in 2008 for blacks. As a result, immigrant Latinos and blacks have closed the gap in homeownership relative to their native-born counterparts. For Latinos, the difference in the homeownership rate between the native born and the foreign born fell from 13.5 percentage points in 2005 to 8.9 points in 2008. For blacks, the gap decreased from 6.5 percentage points in 2005 to 1.9 points in 2008. 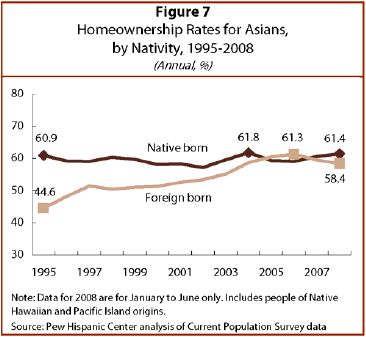 Asian immigrants recorded the largest gains in homeownership, from 44.6% in 1995 to 61.3% in 2006. By 2005, they essentially eliminated the gap in homeownership relative to the native born. However, Asian immigrants did experience a setback from 2006 to 2008 as their homeownership rate fell from 61.3% to 58.4%. The rapid growth in homeownership among immigrant populations and the ability of foreign-born Hispanics and blacks to stem a decline in recent years arise from the forces of economic assimilation. Immigrants’ incomes and their economic status improve significantly with time spent in the U.S. and the acquisition of citizenship. The key question is whether immigrant homeownership would also have declined from 2005 to 2008 if not for the forces that drive assimilation. The number of years an immigrant has been in the U.S. is related that person’s degree of economic integration (Duleep and Dowhan, 2008). Among other things, the longer an immigrant has been in the U.S., the more likely that person is to be a homeowner. After about 20 years in the country, the homeownership rate for immigrants equals the rate for the native born. Figure 8 shows the homeownership rate for immigrants grouped by the number of years they have been in the U.S.15 In 2008, the rate is only 21.4% among immigrants in the country for five years or less. It elevates to 39.5% for those here for six to 10 years, climbs further to 49.8% after 11 to 15 years, increases to 52.3% for those with U.S. residence of 16 to 20 years, and peaks at 69.4% among immigrants here for more than 20 years. The second point is that immigrants are moving into homeownership more quickly than in the past. In 1995, for example, immigrants here for five years or less had a homeownership rate of only 11.7%. In 2008, immigrants with the same length of residence had a homeownership rate of 21.4%. Similar strides in homeownership are also observed for those who have been in the U.S. six to 10 years and from 11 to 15 years. Thus, it appears that newer immigrants have benefited more from the economywide expansion in homeownership. Finally, reflecting overall market trends, the gains in homeownership for immigrants occurred primarily from 1995 to 2005. For example, the homeownership rate for immigrants who were in the U.S. for six to 10 years crossed the 40% threshold in 2005. But since then, it has nudged down. For immigrants in the U.S. for 16 to 20 years, homeownership peaked at 58.6% in 2005. The rate dropped sharply after that and in 2008 stood at 52.3%, not very different from the rate in 1995. As shown in Figure 9, 69.0% of naturalized citizen immigrants owned a home in 2008, compared with only 38.3% of non-citizen immigrants. The homeownership rates and the gap between the two groups of immigrants are not very different from those in 1995, when 68.2% of citizen immigrants and 35.8% of non-citizen immigrants owned homes. 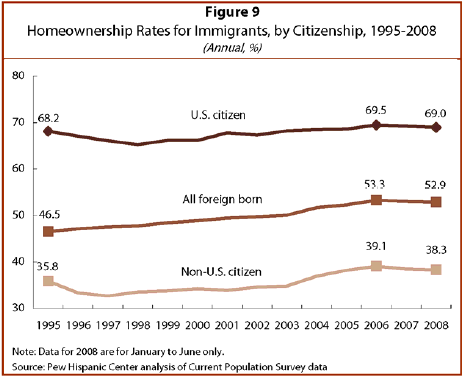 The trends presented in Figure 9 show that the rise in homeownership from 1995 to 2008 was greater among immigrants collectively than among citizens and non-citizens separately. More specifically, homeownership for all immigrants increased by 6.4 percentage points from 1995 to 2008 even though it increased only 0.8 percentage points for citizens and 2.5 percentage points for non-citizens. The reason this happened is that the naturalization rate in the U.S. trended up sharply after 1995 (Passel, 2007). The switch in status boosted the rate of homeownership for all immigrants, even as the increase was more modest for citizens or non-citizens alone. The spread of homeownership among immigrant Hispanics and blacks from 2005 to 2008, even as it ebbed among other populations, is one of the notable developments in recent years. A more detailed analysis shows that the reason lies in the changing attributes of immigrants. Among other things, the average immigrant now has spent more years in the U.S. and relatively more immigrants have planted roots as U.S. citizens. The result is an ongoing rise in homeownership even amid troubles in the housing market. Key changes in the characteristics of immigrant Latino householders include the fact that they are much more likely than in years past to be U.S. citizens—35.8% in 2008 compared with 19.4% in 1995.19 These immigrants also have been in the U.S. longer—42.2% were here for more than 20 years in 2008, compared with 36.1% in 1995. Also, immigrant Latino householders are more middle-aged—54.7% were ages 30 to 49 in 2008, compared with 48.9% in 1995—and better educated—52.8% had completed high school in 2008, compared with 44.4% in 1995. The question is, how does one disentangle the impact of the changing characteristics of Hispanic immigrants from more general trends in homeownership? This analysis uses a statistical model that relates homeownership to a list of personal attributes, such as years in the U.S., citizenship, age, education and income.20 Once the relationship has been established, it is possible to use the model to estimate homeownership rates that relate to any given set of attributes. In this study, the goal is to estimate homeownership rates in each year for the attributes that describe Latino immigrants in 1995. 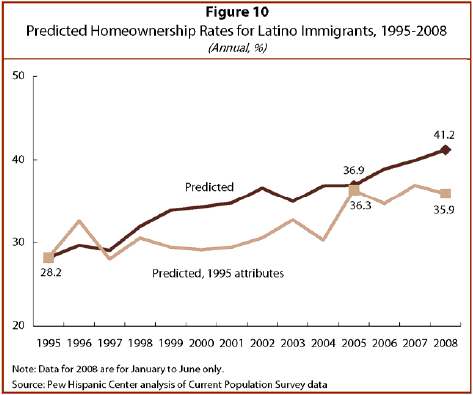 The other trend line in Figure 10, labeled “Predicted, 1995 attributes,” shows homeownership rates derived from the same statistical model in each year under the assumption that, on average, Latino immigrants in that year possessed the same attributes as Latino immigrants did in 1995. That means that we disallow any change over time in the characteristics of immigrants, including the number of years they have been in the U.S., naturalization rates, schooling and age. 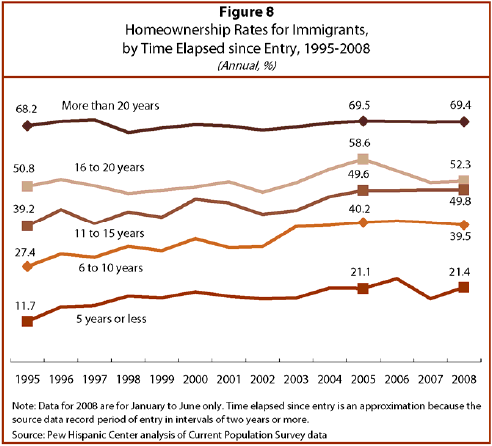 From 1995 to 2005, both estimates show a rising tide of homeownership for Hispanic immigrants. In 2005, the statistical model predicts a homeownership rate of 36.9%. The rate would have been slightly lower—36.3%—if immigrants in 2005 had the same characteristics as immigrants in 1995. In the interim, the two estimates show a varying degree of closeness. Generally speaking, if immigrant attributes are pinned to their 1995 levels—in other words they are not allowed to “imrpove”–the estimated homeownership rate is lower. From 2005 to 2008, the two estimates reveal divergent trends. The predicted homeownership rate continues a steep rise, from 36.9% in 2005 to 41.2% in 2008. 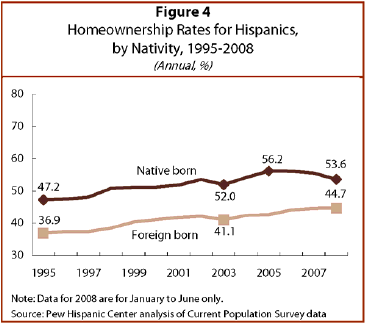 That accords with the actual change in homeownership rates for Latino immigrants (Figure 4). However, if attributes are held to their 1995 status, the homeownership rate for Latino immigrants shows virtually no change—35.9% in 2008 compared with 36.3% in 2005. These results show that Hispanic immigrants were not immune to the downturn in the housing market that began in 2005. The observed increase in their homeownership rate from 2005 to 2008 is estimated to have arisen largely from the forces of economic assimilation. If not for changing characteristics, such as years spent in the U.S. and naturalization rates, Latino immigrants’ experience would have been more similar to that of native-born householders—rising likelihood of homeownership from 1995 to 2005, followed by either a leveling off or a decline.